Kyle thinks Jim Boeheim will win his second title, likely not while wearing this sport coat. 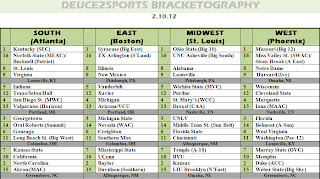 "The times bracket, it is a-changin'." 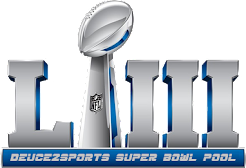 Every week Chris presents new bracket projections and I follow with its predictions. This week’s games made quite the difference in the pairings and what the results could be. Most surprising upset: 11 Southern Miss over 6 Creighton and 3 Michigan State. I’ll preface this by saying I haven’t watched one game of the Golden Eagles all season but from the games and news as of late regarding Creighton and Michigan State, I have a sneaky suspicion that Larry Eustachy gets Southern Miss into the Sweet Sixteen. Creighton’s loss at Evansville (and other recent close calls in conference play) has knocked it off the Missouri Valley perch. Michigan State, although rolling through the Big Ten, still has four games versus ranked opponents left in Big Ten play, which could bang them up before the tournament starts. Only downside of Southern Miss’ success would be the rise (again) of Brett Favre, stealing the spotlight and thus déjà vu. Least surprising upset: The broken record plays again: 12 Cleveland State over 5 Wisconsin. I’ll continue to have Wisconsin on upset alert until they win a game over 70 points and prove that their offense isn’t solely based off using all of the shot clock and second chance bail out opportunities. With that said, I’ll move onto a different pairing, in the form of a question. Is Duke over Missouri an upset? Is a 2 seed over a 1 seed surprising to anybody regardless of who the teams are? Given first the Missouri Tigers, the run-and-gun squad with new coach Frank Haith, are proving to the nation that this system works. On the other side are the Duke Blue Devils, the proven system for last thirty-plus years, is coming off a spectacular win over then-favored North Carolina. Duke is only going to get better as Austin Rivers’ confidence grows. If you like track meets coated with three-point bombs, this is the game for you. The size difference is in Duke’s favor, allowing the inside-out game. Missouri will be ready for this after similar conference games versus Kansas and Baylor (both twice), but I think the Blue Devils will sneak by to New Orleans. Darkhorse Final Four contender: Kansas and North Carolina stand alone as the best teams to reach the Final Four. 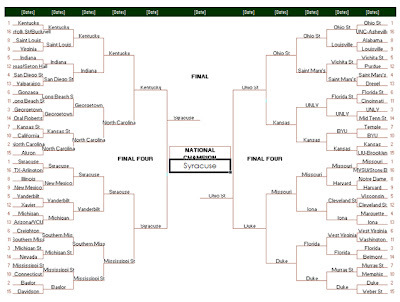 Both have suffered close losses as of late but still very poised to get to the Final Four. The development of Kansas center Jeff Withey will add another weapon to the Jayhawks strong inside presence. If Tyshawn Taylor can limit his turnovers, Kansas has a good shot for the Final Four. North Carolina also presents another challenge for tournament teams. As hyped at the beginning of the season, the Tar Heels return their entire starting lineup from last year. Tyler Zeller and Harrison Barnes have kept poise during an arguably “down year” compared to the hype. Don’t let the lack of dominance fool you; the Heels are still able to score and would love to get into a good rhythm starting in mid-March. Other notable games: 6 Gonzaga vs. 11 Long Beach State, 1 Kentucky vs. 2 North Carolina, 1 Syracuse vs. 5 Vanderbilt, 3 Florida vs. 2 Duke, 5 Wichita State vs. 4 Saint Mary’s, 1 Ohio State vs. 2 Kansas. Champion: Syracuse. 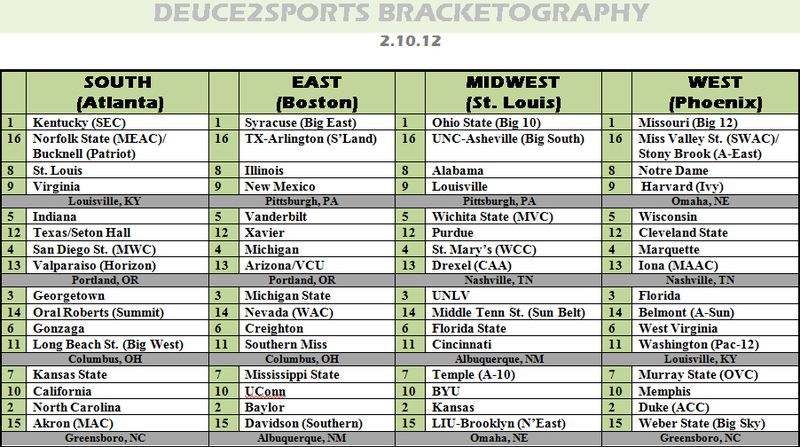 Based on the projections, I have South Region versus East Region, West versus Midwest. This will force a collision course of 1 Kentucky with 1 Syracuse. 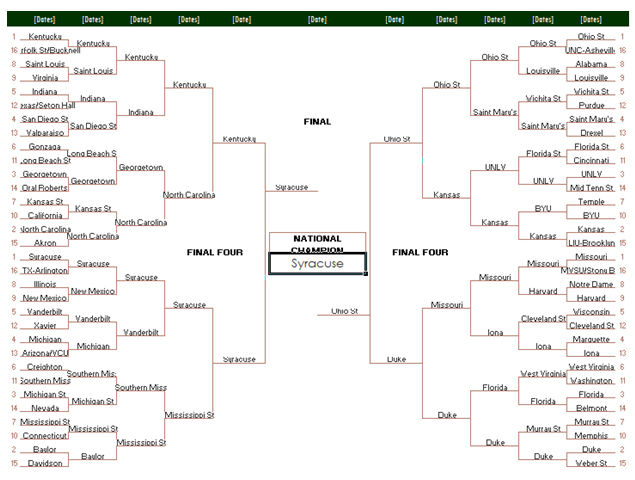 The current water cooler matchup calls for this but not on the same side of the bracket. Syracuse gets by Kentucky (barely) and then takes Ohio State into overtime to win. Does Jim Boeheim retire? Two titles but only a few wins shy of passing Bob Knight for second all-time in career Division-I wins? That’s up for debate.